In many ways, clutter is like a disease. If you leave it unchecked, it will spread until it buries you. This comparison may sound a bit extreme, but joking aside, clutter in our homes is a problem and it has to be dealt with – sooner the better. Waiting for the right season, or the right time are just excuses. Use these few tips we will give you and start de-cluttering right now. One of the most common causes of clutter is sentimentality and the naïve thinking that something will serve some purpose somewhere in the future. A lot of uncertainties in one sentence, right? Unfortunately, huge part of items we keep in our homes, if not the majority of them, is simply unnecessary and it will never be used. In order to identify such items, you will first have to throw everything but the bare furniture (although, there may be even some furniture pieces which are redundant) out and slowly move in only the things which are essential for your life. You will see just how much junk will remain outside. There are, of course, some situations when you will actually need to save some items for the future times, but you will need to store them outside the house. In that case, expansion is the only sensible way to go. Fortunately, outdoor solutions are very affordable and range from the regular tarps, all the way up to full-blown no-nonsense sheds. What makes them even better is that making them does not falls away from the usual DIY territory. If you, on the other side, want the best protection for your stuff. Do not get us wrong, there is nothing bad about earning some money on the things you bought hoping that you will use them someday. Still, if you are well-situated, you should strongly consider donating some of the things you do not need to the people who need them the most. You will still have a chance to earn on the collectibles, magazines and other more exclusive stuff, but as for the clothes and all the other things that befall into the group of the basic human needs, charity is certainly the more noble way to go. Just think of all the children who need just a little thing to make their day beautiful. Once you carefully store what needs to be preserved, you will still end up with the excessive amount of things you will simply want to lose. The best way to do that is to organize a good old garage sale. 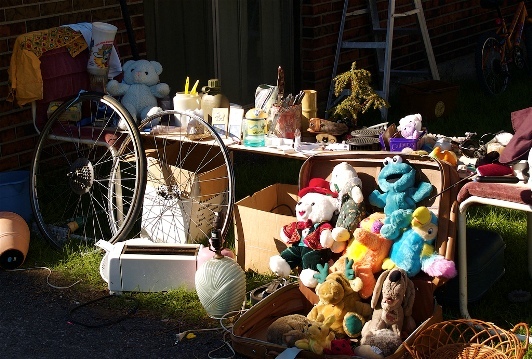 People just love to buy stuff from someone's garage or attic. Set the date, release your inner Don Draper and distribute the advertisements across the neighborhood (although, expanding your efforts throughout entire city is much better if you can afford it) and sell whatever you can. Once you are not in dire need to throw everything at once, you can play a little game to keep the clutter on the minimum. Every day, choose one item you do not need and sell it. At the end of each year you will have 365 useless items in your home less. You can go one step further and consider putting some interesting window graphics, and your garage sale will be noticed – that's for sure. Fighting the clutter can be time consuming, and tiresome, so as the time goes by we tend to become more tolerant in that regard. Still there are some times when enough is enough and the red alert is turned on. If you find yourself in such situation, just use these few tips we gave you and you will solve this irritating problem in no-time.